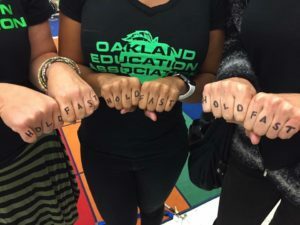 We have a proud history advocating for students and educators in Oakland. We trace our roots to the Teachers Pension Club of Alameda County (founded 1891) which became the Oakland Teachers Association in 1915 and then renamed the Oakland Education Association in 1964. Today, we continue to build on the successes of past parents and educators to realize our vision of putting students at the center of everything we do.